One of the nicest things about living in Maine is having access to the Wild Maine blueberries. When you are in the area, we encourage you to eat as many of them as you can do as they are not readily found outside the state. I’ve been a blueberry fan all of my life, but once you’ve tried these little wild blueberries, it’s hard to go back to the regular kind. 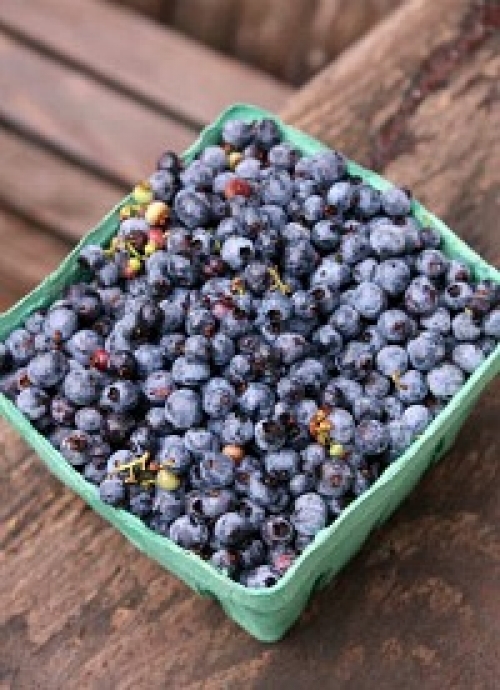 The little berries are packed with flavor and have twice the antioxidant properties of regular blueberries. ltivation of wild blueberries in Maine goes all the way back to the Native American Indians who used the fruit fresh and dried for food and medicinal purposes. Maine has more than 60,000 acres dedicated to growing these indigenous berries with record level crops over the last couple of years. The blueberry plains near Sanford are a great location near the In for picking your own later in July and into August. Because that’s our busiest time of year and we can’t get away from the Inn to pick our own, we buy ours from Patten Berry Farm right down the road. During the winter months, the frozen blueberries are every bit as good as the fresh one’s and keep us going all year long. Wyman’s is one of the largest suppliers and sell bags of frozen fruit in Hannafords throughout Maine. We use blueberries year around here at the 1802 House Bed and Breakfast. From smoothies to pancakes, we’ve got a lot of recipes featuring these little fruits. We thought we would share a couple of our most requested one’s with you here. Our Blueberry Cornmeal Muffins are a Williams Sonoma recipe that we make just as it’s been printed. We had some UK guests who were sure these were the best muffins they’ve ever had! Not too sweet with a hint of nutmeg, loaded with berries and a sprinkle of cinnamon and sugar on top. It takes a few minutes to mix them up so great in the mornings when you don’t want to spend a lot of time in the kitchen. They’re good with regular blueberries, but great with the Wild Maine fruit! We also get a lot of requests for our 1802 House Bed & Breakfast Baked Blueberry Cinnamon Oatmeal recipe. Great for our gluten free guests (we buy gluten free oats). Preheat oven to 350 degrees F. Generously butter a 9 x 13 glass baking dish. In a large bowl, mix together the dry ingredients. In a separate bowl, mix together the butter, milk, cream, eggs and vanilla. Pour into the dry ingredients and mix well by hand to combine. Fold in apples and blueberries. Spread into the baking dish. Bake in a preheated oven 45 minutes until lightly brown on top. Let sit for at least 10 mins before cutting and serving in squares. We pour a little maple cream sauce over the top before serving. Serves 12.